Blizzard warnings are in effect for parts of the central Plains and Midwest as a potent snowstorm gets ready to crank out a heavy dose of winter weather to close the holiday weekend. Track means everything for this classic winter storm, as a dozen miles to the north or south will determine both the location of the rain/snow line and the axis of deepest snowfall accumulations. A strong low-pressure system developed in southwestern Kansas during the day on Sunday. The low will continue to strengthen as it swiftly moves to the northeast. Precipitation will fall in the form of snow to the north and west of the center of low pressure. The greatest snowfall totals will fall along a path that lies a few dozen miles to the northwest of the low's center. Right now, the Weather Prediction Center expects the heaviest swath of snow to follow along a path from northeastern Kansas through central Michigan. It's already snowing across the central Plains and it'll quickly spread east across the Midwest through Sunday morning. The snow will probably last most of the day on Sunday in the Midwest before tapering off through the night. 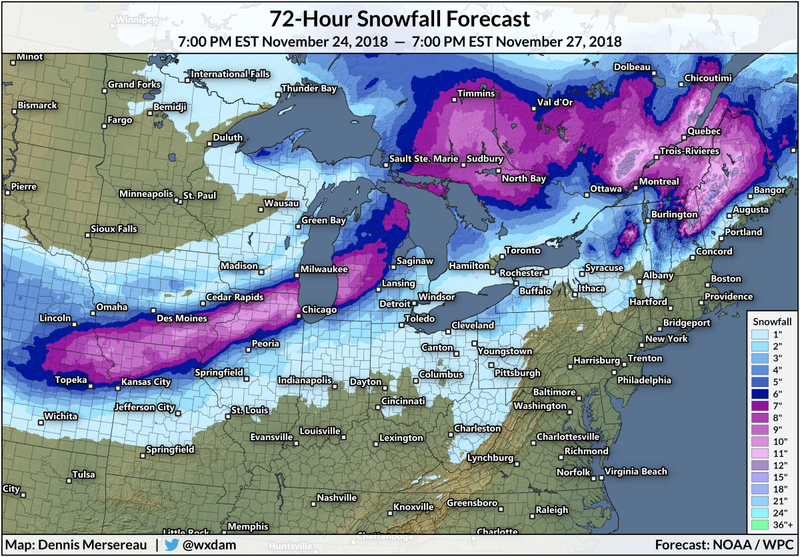 The storm will pull out of the Great Lakes by Monday night. The sharp rain/snow line and relatively narrow band of intense snow will make the final outcome reliant on the precise track of the storm. If the low-pressure system strays a dozen or so miles to the right or left of its current predicted track, it'll pull the rain/snow line and deepest accumulations right along with it. That's a scary prospect for travelers heading through Chicago this weekend. Sunday is historically one of the busiest travel days of the year as people rush to get back home after the long Thanksgiving weekend. 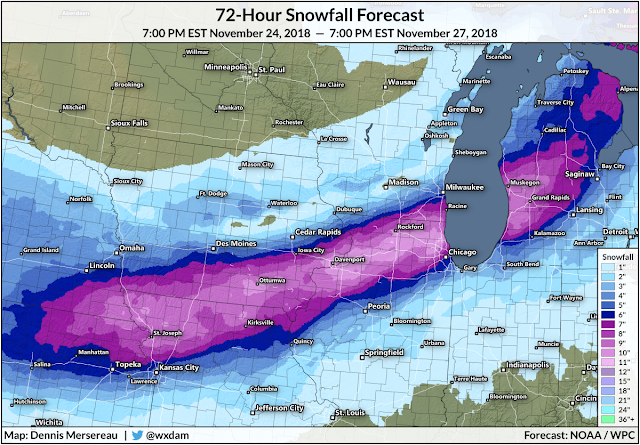 The most impressive snow totals from this blizzard will come perilously close to Chicago's O'Hare and Midway Airports, which combined handle more than a thousand flights every day. Heavier snow will lead to heavier travel disruptions. The delays and cancellations in Chicago will ripple through flight schedules across the country due to the sheer volume of connections that funnel through Chicago's two airports. Winds will grow pretty intense along the track of the storm on Sunday. Blizzard conditions are possible in that heavy swath of 6"+ snowfall totals. A blizzard occurs when winds of 35 MPH reduce visibility below 1/4 of a mile for three consecutive hours. These whiteout conditions are so disorienting that it's easy for motorists to crash into unseen obstacles like ditches, poles, and other cars. It's also dangerous for people who are out on foot, since you can quickly lose track of where you are and get stuck in the open in the extreme cold. It's also worth pointing out that winter storms are not officially named in the United States. The Weather Channel unilaterally names winter storms; the National Weather Service does not participate in the private company's naming program. Some companies and even local/state governments have chosen to use these names. However, most major international news conglomerates (yours truly included) do not use The Weather Channel's names. Please consider subscribing to my Patreon. Reader-funded news is more important than ever and your support helps fund engaging, hype-free weather coverage. I graduated from the University of South Alabama in 2014 with a degree in political science and a minor in meteorology. I ran Gawker's The Vane for two years and I've contributed to Mental Floss, Forbes, Popular Science, and the Washington Post's Capital Weather Gang. I also teamed up with Outdoor Life to write a book called The Extreme Weather Survival Manual, which came out in October 2015.